Very long novels have perennially commanded our attention—Donna Tartt, Marlon James, Hanya Yanagihara, and Garth Risk Hallberg have written four of the most discussed novels of the past three years; they are all more than 700 pages. 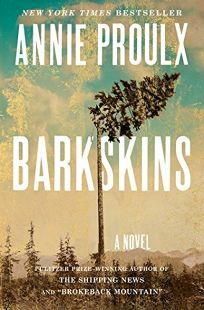 But Annie Proulx’s Barkskins is remarkable not just for its length, but for its scope and ambition—it spans more than 300 years and includes a cast of dozens. It’s a monumental achievement, one that will perhaps be remembered as her finest work. Structured in 10 novella-length sections, the book begins with two Frenchmen, René Sel and Charles Duquet, who arrive in New France (now Canada) in 1693 to work for a local seigneur in exchange for land. The first section is about Sel, a born woodsman who fathers three children with Mari, a Mi’kmaq woman. The second follows Duquet, the wilier of the two, who runs away and, snatching up tracts of woodlands in the northeast, founds a timber company in Boston called Duke & Sons. The subsequent sections alternate between each man’s bloodline, tracing displacement, resettlement, and death, finishing in 2013. The descendants of Sel battle the erosion of Mi’kmaq culture (at the book’s end, their number dips below 1,500), often struggling to adapt as Europeans flood North America, while the Mi’kmaq drift and take labor jobs as they are uprooted. Among the Sels are Achille, René Sel’s son and a master hunter, who goes on a moose hunt but discovers English soldiers waiting when he returns home, and Jinot, a Sel descendant further down the line, who finds himself cutting huge kauri on an ill-fated journey to New Zealand. Meanwhile, Duquet’s descendants take up the family business. James Duke, Duquet’s great grandson whose “future flickered before him as a likely series of disappointments,” pushes west to find new sources of timber. And James’s daughter, the hungry and enterprising Lavinia, perhaps the book’s most memorable character, brings unprecedented growth during her time at the helm. The middle of the book can become a bit overwhelming, as the reader attempts to juggle all the new characters and story lines Proulx introduces, but, as in the best epics, the later pages are weighted with all that’s come before. Decisions and incidences have ramifications that pop back up again, often hundreds of years later, in astonishing ways. In relating character to setting, repeatedly showing how one influences the other, there are shades of Steinbeck’s East of Eden. But the forests are decimated, and characters are summarily, violently dispatched, often offstage. And as years pass in the space of a few pages, it becomes clear that history and time are the main characters here, each moment incremental and nearly insignificant in and of itself, but essential in shaping the world that emerges at the story’s conclusion. It’s exhilarating to read Proulx, a master storyteller; she is as adept at placing us in the dripping, cold Mi’kma’ki forests as in the stuffy Duke & Sons parlors. Despite the length, nothing seems extraneous, and not once does the reader sense the story slipping from Proulx’s grasp, resulting in the kind of immersive reading experience that only comes along every few years. Gabe Habash is the deputy reviews editor of Publishers Weekly. His debut novel is forthcoming from Coffee House Press.